Thanks for asking me to do a class. This has been really good for me. A little slow but it's good to push yourself don't you think? 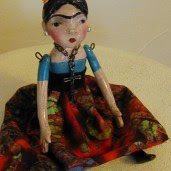 Come on over to nancyesartdolls.ning.com and see what's new. Yes, it's the Prayer Box dolls. The cost is minimal and they make real cute little gifts for those in need. If fact I'm going to make a bunch and give them to cancer patients at the oncology office next week. Feel free to join the network and take the class if you are so moved.